Good health starts in your gut, right? I’m sure you’ve heard me say this many time. But you’ve probably wondered (as have many listeners) about how to make fermented foods that are loaded with the good bacteria (aka probiotics) for your gut! You could take a probiotic supplement to help get the job done, however fermented foods are one of the easiest ways to naturally consume probiotic-rich foods without the hassle and expense of pills. If you’ve ever looked at the really good quality probiotics, they can be pretty expensive. Plus, many have to be constantly refrigerated and for those (like myself) who loathe/fear swallowing big pills, fermented foods are much less stress-inducing to eat. Plus, you can easily make your own probiotic-rich fermented foods that can help with gut health and healing for a fraction of the price (especially important if you’ve got budgetary restraints). Either way, you can use homemade fermented foods as a way to additionally supplement on top of your store-bought probiotics or use them on their own. The big WHY to eat fermented foods is because of how important getting these good bacteria are into your digestive system. If you’ve ever taken antibiotics, one seven-day round can set back your gut flora for two years! Plus there have been many articles in the mainstream press about the benefits of probiotics in treating mental health issues and more. That’s why adding in fermented foods to your daily meals is an easy way to boost gut, mental and total body health. Listen in to this week’s interview where I break down your questions on how to make your own fermented foods at home so that you can get started! Jennifer Fugo: Welcome back to the Gluten Free School Podcast. I’m your host, Jennifer Fugo. Today we’re going to talk about fermenting foods. Now, I am a total novice at this whole idea of fermenting food. The only thing that I’ve ever fermented in my life was kombucha, and I don’t even do that anymore. It is one of those ways of cooking that makes people nervous because they’re afraid they’re going to get sick or it’s going to go bad. We’re not just all that familiar with doing this. I asked Kirsten Shockey to join me. Kirsten got her start in fermenting foods with her family’s farm stand food company, where she and her husband created over 40 varieties of cultured vegetables and krauts. When they realized their passion was for the process, they chose to focus on teaching the art of fermenting vegetables. They still experiment with new recipes, help others to set up in-house or farm stand fermentaries, teach classes at their farm, and host small-farm workshops. Together they wrote the book Fermented Vegetables: Creative Recipes for Fermenting 64 Vegetables and Herbs in Krauts, Kimchis, Brined Pickles, Chutneys, Relishes and Pastes and they both maintain their blog at www.Fermentista.kitchen. Kirsten, thank you so much for joining us! Kirsten Shockey: Yeah. Thanks for having me. Jennifer: I know we said you got your start at the family farm stand, but why fermenting food? I’m just curious. Some people are into baking. Some people are into cooking at the stove. Why fermenting? Kirsten: Actually, we have this little homestead and we’ve done cheeses. And Christopher does love to bake. We were trying to find a business based out of our homestead that we could do together as a family. The awesome thing about fermenting is that it’s so safe and it’s so easy. We knew that our kids could participate in many aspects of creating the product. And also in Oregon, the laws to get the certified kitchen around fermentation are so much simpler than for cheese, for example. Jennifer: Wow! That’s really interesting. So why don’t you tell us a little bit about exactly what it means to ferment something? Kirsten: So it’s an ancient practice. The art of fermentation has been around for a long time. The vegetables and have bacteria all over them when they come from garden or the field. Lactic acid is one of them. [When you ferment], you’re creating an environment where the lactic acid can thrive. When the lactic acid starts moving in this environment, it grows in it. It starts eating the starches, the carbohydrates, the sugars of the vegetables. As it’s doing that, it’s making the whole balance in this brine. It’s all anaerobic in the crock when you’re doing this. It makes it acidic. It’s actually the acidification of the vegetables that preserves it. Jennifer: Interesting! I used to make a lot of kombucha and I don’t do that anymore. Would that be considered fermentation? Kirsten: That is a kind of fermentation. It’s not lactic acid fermentation. The kombucha scoby is a bacterial mat. And yes, it’s doing the same thing. It’s taking that sugar that you put into your tea and getting it acidic. If you take kombucha too long, it will end up tasting like vinegar. Jennifer: Yeah, it can go too far. Kirsten: Right. And fermentation is that same idea of eating those sugars, eating those carbohydrates. The beautiful thing that happens as lactic acid is eating those things is that it’s pre-digesting the food for you. It’s pre-processing it for you. A lot of great health things are happening at the same time. Pre-digestion makes it easier for your body to assimilate the nutrients. The nutrients are also becoming more enhanced. For some reason, vitamin C, vitamin K, vitamin B12 are part of what’s in it now. It creates those as it’s going. The vegetables actually become more healthful, and some people even argue that they become safer because none of the bad bacteria that might be on a fresh vegetable, like E.coli, which gets on the news every now and again, can live in a fermentation crock. Jennifer: Here’s the thing. You mentioned the health value. Why should we eat fermented vegetables? Kirsten: The health value is pretty incredible. We should eat them because they taste really good. It’s really a lot of fun once you start getting into fermentation to realize that you can create these fantastic flavors that are just so new and unique. I think that’s why they’re gaining a lot of publicity with the celebrity chefs and all that kind of stuff. But as far as the health benefits go, again you’re making nutrients more bioavailable. It’s easier for your body to digest. We’re learning so much right now about the gut biome. You’re creating this food that also helps repopulate the gut biome. Some of us have pretty damaged systems just from processed foods and antibiotics [and other things we ingest]. Jennifer: A lot of us do have those issues. I know for myself, I also don’t like to take pills. So [I don’t like] the idea of taking a probiotic every day [in pill form. ]I have a fear that goes back to childhood because I choked on a piece of candy. So trying to get me to take pills is not easy. However, you can eat food, which is even better, and how much more efficient is that? It’s tasty too. You can just add to your dish and eat it. And there you go, you’ve got your probiotics. What are some of your favorite fermented foods that you add as a condiment to other dishes? Kirsten: It’s seasonal for us. This time of year, what I just love, as we’re getting away from the fresh tomatoes and all of that, I love sauerkraut that comes from a Latin American El Salvadoran tradition. It’s called cordito. It has the same pizazz and freshness as adding salsa to beans or to your omelet in the morning. So that’s one of our favorites. Christopher, my husband, loves making the homemade pepper paste. It’s like having your own sriracha on hand. So those are really two very simple ones that even people that think they don’t like fermented vegetables or sauerkraut love. We have another recipe for a really simple sauerkraut that has lemon and dill and some garlic in it. We called that often our gateway kraut when we would have a stand at the market. People would say, “No, I don’t like sauerkraut.” [But] if we could get them to try it and realize that this sauerkraut that we’re talking about here has nothing to do with the canned yucky stuff that people think of, the lemon dill was the one that they took home with them. Jennifer: Interesting! That’s still made with cabbage? Kirsten: It’s still made with cabbage, with that and a few other little just herbs and garlic like I said. It gives it a bright sparkly flavor. Jennifer: I would love to know this. This is where I get nervous. I have these good intentions to make sauerkraut. But it has never happened because when I start to really think about it, practically speaking, I don’t know how you know when it’s done. Can you go too far in fermenting food? We did say with kombucha you can. But with these vegetables, can you go too far? Is there a specific cut off where you say, “Okay, this sauerkraut should only ferment for five days?” Is there some rule like that? Kirsten: The answer to a lot of those questions is, it depends. However, the beauty is, if you follow a few simple rules, simple guidelines, [you’ll succeed]. And there are a lot of people like you, Jennifer, that just really need to see it happen the first time. They love to come to the classes simply because they’ve read about it, but they want to watch it happen. So the simple thing is to keep everything submerged, keeping the brine overtop of your vegetable and no air bubbles in there. What we tell people is, start small. Start with a little mason jar on your counter and watch it. Watch what’s happening. Watch the next morning as you’re starting to see the carbon dioxide build up between the shreds of kraut. When you do, press on it. Push on it. It’s not like canning where, if you get it wrong or if you touch it in the process, it can all go wrong. It’s a lot more forgiving than that. Keeping it under the brine is your big thing. We tell people to taste it. Taste it at three or four days. If you like it, great, put it into your refrigerator. If you’d like it more sour, keep it going. So that’s what happens when it goes too long. It just keeps getting more and more sour as more and more bacteria do their work of eating the starches. We have refrigerators now. So we can pull them early for people that don’t like it super sour. Whereas in the old days they of course needed to keep it out [on the counter]. Where it can go wrong is if it’s sitting under the counter for a long time. The stuff on top, the stuff exposed to the air, can get contaminated if the brine layer isn’t super thick. Often, when you just take that layer off, though, what’s underneath and what’s safe under the brine is good. We tell people “sinking in brine conquers evil every time.” Just to have a little something to hold on to. Jennifer: For somebody who doesn’t know what brine is, what exactly is brine? Kirsten: Brine is the salt solution that is made by thick vegetables themselves. So let’s back up to the process. You shred your vegetables, either cabbage or carrots or beets, or you mix cabbage and beets. And then you sprinkle the salt in there and massage it in. As you do that, the cell structure starts breaking down and the juices from the vegetables themselves get released. When they do, that is your brine. That’s your salty liquid. It’s actually not even that salty, but salty enough to give the good bacteria the upper hand and to harden your pectins to keep everything nice and crisp. So that’s what you press. You press your vegetables in your jar and that brine rises to the top. And then you’ll need to weight it down because once your bacteria start eating those starches as I mentioned before, carbon dioxide is created. Well, those create little bubbles. It can look like a champagne glass. Those little bubbles are just wanting to leave. So the best way with the simplest tools if you have nothing, no crocks at home, is just a jar and a Ziploc bag. And then you’ll stick your Ziploc bag down over your well pressed vegetables and fill that with water. And the water will seal that bag. It will seal the edges. It will create a nice environment. And it will create some weight to help keep the brine down and allow the carbon dioxide to escape. Jennifer: Are there some no-nos to this process? I’m wondering, what if I have a window and there’s sunlight pounding in through the window? Is that not a good spot to have your vegetables sitting that are fermenting? Kirsten: That wouldn’t be the preferred spot. If your counter is all sunny, then you can throw a little towel over [the fermenting vegetables] and just help keep it a little bit darker in there. You don’t want them to heat up too much. Another spot on your counter that you might want to avoid is next to the back of the refrigerator where that warm air is coming out. There are a lot of people that believe, “Oh, it has to be in a cool dark closet.” They’ll put it away and not watch it. But especially with these small batches, it’s much better (even if it’s not the perfect spot on your counter) to be able to watch it, especially when you’re just teaching yourself how to do this. Often, when you put it away and you really aren’t watching it, you can get a little air in there that you don’t notice. You come back a week later and your brine is on the floor and there’s air in your ferment, and then you’ve got slime and things that don’t taste good. Jennifer: No. That doesn’t sound good. So do your kids enjoy doing this process with you? Kirsten: They did, especially when they were younger. I would just send them to town with a tamper so they could pound on the kraut that had the salt in it and beat out the brine. They loved that. Now that they’re teenagers, yeah, it’s not like before. But they do like to eat it. Jennifer: There are different types of fermented vegetables, yes? What are they? Kirsten: When we first started fermenting, we didn’t do anything but cabbage. And then we slowly started adding maybe some carrot or something like onion or garlic to our cabbage. And then slowly, as we got more and more curious and got more and more comfortable with the process, we started just doing straight parsnips or straight celeriac root. We found that you can ferment just about any vegetable. Actually, you can ferment any vegetable, some of them just aren’t as tasty. Jennifer: What are some vegetables that you would advise people to avoid if they’re thinking of getting into fermenting vegetables? Kirsten: Definitely, I would avoid broccoli. The first week or so, it tastes fine. It sours a little bit. But then, do you know that sulfur thing that broccoli can get going? Kirsten: That, it’s not pretty in the fermented form. Another one that I haven’t had great success with (and I don’t know anybody else that has on its own) is kale for some reason. We do fine with collards and so many of the other cruciferous vegetables, like brussels sprouts. But for some reason kale, on its own, doesn’t ferment really well. Most everything else is pretty tasty, though. Even things like spinach, you would be surprised. Jennifer: Are you making them predominantly into sauerkrauts? With brined vegetables, is [the method] slightly different from how you would handle the vegetables with sauerkraut? Kirsten: Yeah, definitely. Sauerkrauts and the condiments—relishes, chutneys, —they all use the same process as the sauerkraut. What’s happening is the salt is coming onto these sliced or cut or diced vegetables and releasing the salt. The brine is made from the vegetables’ juices. With the brined vegetables, like a pickle, that can be anything. It can be chunks of carrot. It can be chunks of cauliflower, asparagus. What you’re doing is you’re having larger pieces of vegetable, and they’re not going to release enough brine to submerge themselves. So you add a saltwater solution on top. So like a New York deli-style pickle, that Jewish style, brined, garlicky pickle like Bubbies, those are brined lactic acid fermentations. That salt water is added on top. And then what happens is the vegetables’ own juices and the saltwater, they have an osmosis with each other. While that’s happening, again that brine is acidifying and preserving the vegetable. Jennifer: For those of us that are interested in doing this and giving it a shot, where is the point where you think, “Okay, this is good enough”? What do you do with it once it’s done fermenting? Kirsten: You simply put it in your refrigerator. You want to, of course, put it in a vessel that’s about the right size for it because like any condiment in the fridge, too much air space can give stuff a chance if it gets contaminated with a dirty fork or something to grow [mold] on top. So put it in a jar. Press it down into its brine, and then stick it into your refrigerator. And then it’s shelf-stable for a long time, up to a year or more. Jennifer: Oh, wow! So if you’re a gardener or if you go to the farmers’ market, or maybe you have a CSA share and you get way too much produce, this would be a way to save some of it without having to necessarily cook it or freeze it. You could actually ferment them. Kirsten: Absolutely! In fact, when we wrote the book, we organized it A to Z. Part of our thinking is exactly what you said. At the farmers’ market, there’s a great deal on arugula or you’re getting too much Jerusalem artichoke roots in your CSA box and you’re like, “What do I do with these things?” You can open the book to that page and just get some ideas. And definitely, it’s been popular with people with CSAs when they just have too much of something. Jennifer: And I know too, for me, I’ve been really trying to eat more kimchi, a little more sauerkraut. Like I said, adding in these fermented foods in place of pills. I just think that we’re such a pill-driven society. We figure, “Oh, well, I’ll just take a pill for that.” Wouldn’t it be nice to be able to get our nutrients and things that will help heal the gut and help us feel better if we could just get it from food? Yes, there are companies out there. If you’re listening to this and you’re like, “I’m never fermenting vegetables. I don’t have time. I don’t even want to try it,” there are products like Bubbies. You said, Kirsten, that it’s a company that does fermented things. There’s also another company called Wildbrine. I’ve had their fermented foods which are great! But I am interested in doing this, and I know a lot of people who are also interested. I wanted to demystify this, not just for myself, but for everyone else who’s actually asked me about this. What are some of your favorite things that we might not think of adding, say, sauerkraut or a paste or kimchi to? With your family, it sounds like you guys eat a lot of fermented foods. Do you have some combinations of things you might add on one of these fermented foods to that you might not expect, but tastes really awesome? So that makes it really easy to have all kinds of ferments in your meals because you’re looking for places to put them. We also have a lot of different things in our refrigerator at the same time. So often, I will just put something on the table and people will grab it or not depending on if they feel like it that day. So that’s really the first part. The second part of your question is, what are some fun things? We like to put it obviously on things like hotdogs, bratwurst. Anything like that is delicious. But they work really well sprinkled on top of the salad and then a little olive oil. It will give you that acidity that a salad dressing would. And if you’re using, like I said, that lemon dill kraut or something like that, you’re almost getting like a lemon dill garlicky salad dressing by sprinkling some of that and tossing it with some olive oil. On an omelet, as I said before, it’s quite wonderful. And then on top of a soup. We’re getting into that time of year where soup feels really good. After you serve your soup, throw some fermented food on top and then mix it in as you’re eating. It gives you this bright flavor. Before you add more salt to your soup or something, it will just deepen the flavor of your broths. Jennifer: I love that idea. But the point here is they should not cook. You shouldn’t go and put the soup in the pot and add, we’ll just say, a sauerkraut. You don’t want to heat that all up together. You would want to add it after you heated it up and eat it then. Correct? Kirsten: Yes, especially if you’re wanting to keep those probiotics alive. In our book, we do have some recipes where we do heat it because it still is a great food and it’s still using vegetables from the garden that we’ve preserved. Like everything, there’s a balance. But when you’re really trying to get probiotics, you want to keep it under 103 degrees. So if you put it on top of your soup, you’re fine. You’re getting it warmed up a little, but you’re not killing it. Jennifer: I love that idea. That is so neat. Thank you for sharing that. One of the coolest things – I’ll share this as well – is I think people forget you can add avocado chunks to soup. So that’s how I make my chicken soup. I add some fat to it. Now I’m totally going to do this. I’m going to add some kimchi to the top of that as well. So I’m really excited. Kirsten: Yeah. It’s so good with kimchi. Jennifer: So this is really great information. And why don’t you tell us a little bit about what people can expect if they go [to your book]. I really encourage everyone check out the book that is an amazing resource. Again, the name is Fermented Vegetables: Creative Recipes for Fermenting 64 Vegetables and Herbs in Krauts, Kimchis, Brined Pickles, Chutneys, Relishes and Pastes. What can we expect in this book? Kirsten: Well, we tried to do a lot of things with this book. So it’s a big fat resource book. The first part is the master classes. We take the processes of fermentation, kimchi-making, brine-pickling, sauerkraut and then the fun stuff of relishes and pastes and chutneys and that kind of stuff. They’re each broken down into a step-by-step process, pictures, just really trying to help people get comfortable with the process. We have a scum gallery at the very end to try to help people identify what they might see on their ferments that are growing that make them nervous, and reassure them that this is how you take care of it, this is what it is. And then in the middle of the book, we have the bulk of the book, which is the A to Z section, which is vegetables—what to do with different vegetables; what we learned about different vegetables; stories about vegetables. Jennifer: Awesome! That sounds great. Like I said, I am on the nervous side. I am a novice and a total newbie at this, whereas my sister has been fermenting vegetables and things for a long time. And I love that your manual is very simple. It’s to the point. Your book gave me this idea that, “Yes, I probably can do this. It’s not that scary.” It’s like having you next to me, explaining it to me, without me having to call my sister in San Francisco and ask. So I really appreciate all the information that you’ve shared, Kirsten. How can everybody stay in touch with you? Kirsten: Well, our website is Fermentista.Kitchen. And that is a great way to get in touch with us. Jennifer: I will post all the links below this podcast so that everyone can just click on through and easily find you along with a link to the book too. As I said, it’s a beautiful book. I looked at several of these different fermentation books and some, I feel, are just too overwhelming and the process is just too much for a beginner. I felt that your book was really geared toward folks who wanted something simple. Especially if you’re a newbie, this is a great way to start. 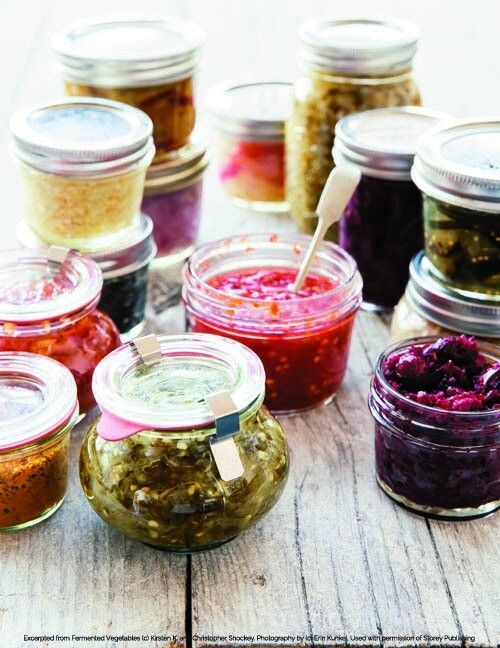 So again, it’s Fermented Vegetables: Creative Recipes for Fermenting 64 Vegetables and Herbs in Krauts, Kimchis, Brined Pickles, Chutneys, Relishes and Pastes. Thank you so much for joining us, Kirsten. I appreciate it. Kirsten: Yeah. Thank you. This was fun. Jennifer: All right everybody. Stay in touch with Kirsten and her husband. All the links are below. Thank you so much for joining us. I really appreciate our growing audience and everyone’s support over the past year. We’re going on two years of this podcast being live! I love that the guests that we’re getting are so knowledgeable. We get to touch on so many cool topics. So if you haven’t done so yet, go subscribe, rate, and review this podcast on iTunes! And don’t forget to leave us any questions or comments that you may have so that we can get you some answers. Thank you guys so much for joining us. I look forward to seeing you the next time. Bye-bye.